Last week Genk lost surprisingly at home again Mouscron. Mhh, didn’t see this coming nor the models did predict it. Antwerp and Standard shared the points and Club Brugge, Gent and Anderlecht won. The lead of Genk has been decreased to only 7 points. While this does look much, it actually is much less. When the Play off starts, the points will be halved. So a lead of 7 points is converted into a lead of 4 points. At the bottom all seems lost for Lokeren. Only a miracle can save them but I don’t see this happening. Here at the models predictions for round 24! Well it is time to honor my name and to use the strengths of the Nyls in full force. A full cover bet is a bet where you do bet on all possible combination of the betting slip. Depending on the number of bets on the betting slip the full cover bet has a special nickname. My nick here on Scorum and Steem is Fullcoverbetting! In general no single bets are placed. When the singles are added to the betting slip a Yankee (four games) for instance in turned into a Lucky 15, the Canadian (fivegames) is named a Lucky 31 and so on. As you can see the number of possible combination are added to the Lucky. A Goliath (8 games) consist of 247 bets with no singles. If we would add the single it would consist of 255 bets. But I am not that crazy nor wealthy! I have analyzing the predictions of the Nyls and its results. 2 market prediction are good enough to be considered to be used as input for a full cover bet! Both are from the model based on the results of the last 3 seasons! These are the Both Teams To Score and the Over/Under 2.5 goals markets. Both also based on the % possibility. So I was searching for a combination of bets, which could deliver a profit on one side with a minimal possibility to go bankrupt! I have been analyzing the results to see, how much times a weekly prediction does have more than 5 predictions correct. I also did the same thing for 6 or more correct. If I would play all sixfolds within a Goliath, this would mean 28 bets, if I would play all the fivefolds this would result in 56 bets. So the double amount of bets. After putting everything together I did notice that if I would have played all the fivefold bets for the complete season with the Over/Under 2.5 % I would have made a profit! Not a big one, but a profit. 7 times out of 23 it did predict 5 games correctly, 4 times it did predict 6 games correctly and 2 teams even 7 games. So in the previous 23 rounds, 13 round would have resulted in a payout. In most cases the pay-out for 5 games correct have resulted in a loss, the 6 games do deliver a profit and 7 correct grants you a small jackpot! 8 games correct would be like finding the pot with gold at a rainbow! 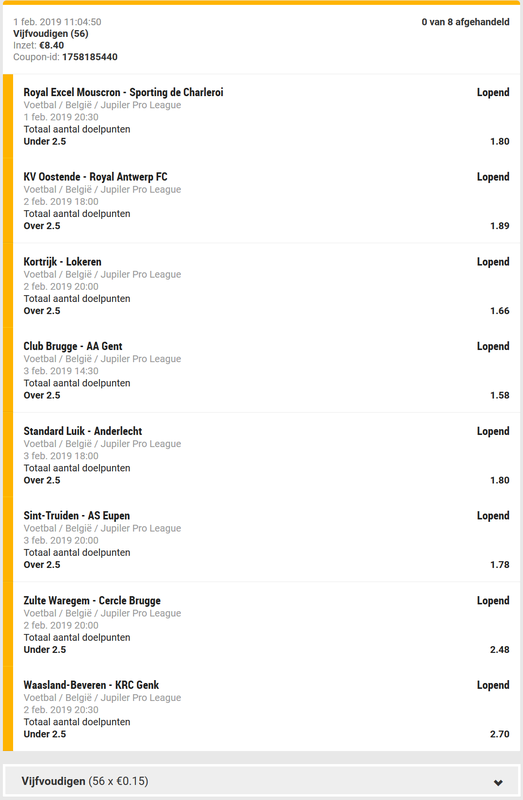 So, I decided to take a risk and will play for the remaining 7 round of the Belgian Jupiler Pro League, all possible fivefold bets on the Jupiler Pro League based on the Over/Under 2.5 goals. On each possible combination I will put 0.15 units. If you are interested a unit for me is €1. So in total 8.4 units are at risk every of the next 7 rounds. In total this will be 58.8 units! To be honest I do expect a negative ROI between -5% and -15% but what is life without taking risks? Too bad I can’t play this on Betscorum, because Parlays can’t be created on a betting exchange! The bookmaker which will be used will not be named but the ones who do bet often, will probably recognized the betting slip! For round 24 this will result in the following betting slip! The best crypto sportsbetting book of the moment ! 0% Commision!